in their personal lives to an extraordinary degree. These individuals have dedicated their lives to serving the poor. This is the highest honor bestowed on a lay person. Affiliates are recommended by the Sisters and approved by the Provincial Council. Once recognized, these individuals share in prayers and good works with the Community and participate with their local Vincentian family. Today, there are 267 affiliates in the United States and Canada. St. Vincent de Paul. We share a belief that God is present among us, particularly in the persons who are poor and abandoned. In 1617, St. Vincent founded the Confraternities of Charity in Chatillon, France, by organizing the lay women in the parishes to “honor Our Lord Jesus Christ and his holy Mother and to assist the sick poor corporally and spiritually.” Their motto is: “To serve rather than be served” and currently there are more than 250,000 Ladies of Charity, also known as the AIC (International Association of Charity), serving in 42 countries throughout the world. In 1857, the Ladies were founded in the United States at St. Vincent’s Parish in St. Louis, Missouri. In 1625, St. Vincent founded his community of priests and brothers to evangelize those living in poverty through words and works, especially those living in the countryside through missions to the people, and the formation of the clergy. Their motto is: “He has sent me to evangelize the poor”, and currently there are about 4,000 missionaries (priests and brothers) serving in 80 countries throughout the world. In 1818, the Congregation of the Mission arrived in Perryville, Missouri. Bishop Joseph Rosati, CM was the first Bishop of St. Louis (1826-1843). In 1633, St. Vincent de Paul and St. Louise de Marillac co-founded the Daughters of Charity to “consecrate their lives to God and to live in community in order to dedicate themselves to the service of the poor.” Their motto is: “The charity of Jesus crucified impels us.” Currently there are approximately 17,000 Daughters serving in 90 countries around the world. In 1809, St. Elizabeth Ann Seton, using the Rule of St. Vincent, founded the Sisters of Charity at Emmitsburg, Maryland. In 1850 the Sisters of Charity of Emmitsburg joined the Daughters of Charity in France. The U.S. Daughters of Charity and the Sisters of Charity of New York, Cincinnati, New Jersey, Pennsylvania (Greensburg), Kentucky (Nazareth), South Carolina (Charleston), Kansas (Leavenworth) plus the Canadian Sisters of Charity of Halifax, the Sisters of Charity of the Immaculate Conception (New Brunswick), the Sisters of St. Martha (Antigonish) and the Religious de Notre Dame du Sacre Coeur (Moncton) form the Sisters of Charity Federation representing over 4,000 members. In 1833, Frederic Ozanam, along with his companions, founded the Society of St. Vincent de Paul. Sister Rosalie Rendu, D.C., mentored the founding members in the spirit of St. Vincent and is considered to be a co-founder of the Society. Its purpose and vision is “to follow the Vincentian spirituality of finding Christ in the poor by enfolding the world in a network of charity.” The motto of the Society is: “No work of Charity is foreign to the Society.” Today there are over 700,000 members in 142 countries world-wide. In 1845, the Society of St. Vincent de Paul was founded in the United States at the Old Cathedral in St. Louis. Today, in the St. Louis Archdiocese, there are 2,600 members in 143 Parish Conferences and 285 members in 18 Conferences in Belleville and East St. Louis, Illinois. In 1835, the first Children of Mary Association was organized, and it received Pontifical Approbation in 1847. This lay youth group has as its purpose: “1) to form members to live a solid faith following Jesus Christ the Evangelizer of the poor; 2) to live and pray like Mary, with simplicity and humility; and 3) to arouse, animate and sustain the missionary spirit of the association, especially through missionary experiences to those who are poorest and to youth.” This organization is now called “Vincentian Marian Youth” and it is undergoing a great renewal throughout the world. Today there are 200,000 members in 80 countries. In 1969, the Daughters of Charity and in 1977 the Congregation of the Mission established “Affiliate” groups. As part of the Vincentian Family, the Women of Charity & Former Daughters of Charity, come alongside the Daughters in prayer, volunteerism, and financial support. Although known by different names in different parts of the Province, these women are truly Vincentian in spirit! In 1997, the Daughters of Charity established Mission and Ministry, Inc. to provide financial resources to allow Daughters of Charity to fulfill their ministry of service to those living in poverty. Serving as a catalyst for change in the communities where the Daughters of Charity ministry, MMI works to alleviate poverty by providing encouragement and financial support for works of the Daughters of Charity and other non-profit organizations which serve persons living in poverty. 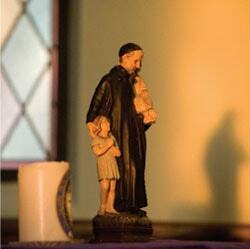 In 1999, the Lay Vincentian Missionaries came about from the heart of the Vincentian Family. Its goal is: “to foster, facilitate, sustain and coordinate the missionary presence and work of the laity in the missions in the world animated by the Vincentian Family”. This association assists young lay men and women, single and married, who want to spend several years of their lives in a foreign mission. In 2005, Vincentian Lay Missionaries USA was established to provide a short-term international opportunity for young adults (18-35) to serve those living in poverty, to live in community, and to reflect together on their experience. Vincentian Lay Missionaries collaborate with members of the Daughters of Charity and Congregation of the Mission who serve in Ethiopia and Kenya to organize summer programs for children to improve their English skills and to participate in athletics, drama/music, and craft projects. When the VLM return to the USA, they continue to support their African sites through systemic change projects. By the end of the summer of 2012, over 75 young adults will have participated in the program. In July of 2012, the Daughters of Charity Vincentian Service Corps and the Gateway Vincentian Volunteers merged to form the Vincentian Mission Corps. VMC provides young adults a year of experience living in community and working with persons living in poverty—all in the spirit of St. Vincent and St. Louise.